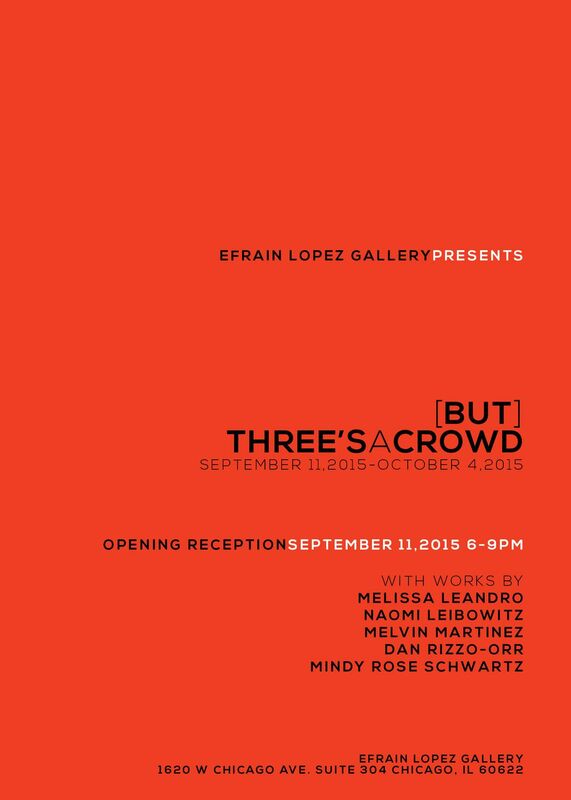 efrain lopez gallery proudly presents its inaugural group exhibition entitled (but) three’s a crowd, featuring works by melissa leandro, naomi leibowitz, melvin martinez, dan rizzo-orr, and mindy rose schwartz. curated by gallery director efrain lopez, this exhibition features both two dimensional mixed media as well as three-dimensional installation works that establish their intimate connection through a shared exploration of labor, material production, and texture. the seemingly stable notions of the “handmade” and the “fabricated” are simultaneously celebrated and questioned through the pêle-mêle accumulation of varied media, spanning textiles, papier-mâché, ceramic, cinderblock, and burlap. techniques of the photogram, fabric transfer, and macramé are woven to compose an ever-present essence of the art as assemblage in every sense. harnessing the emotionality of the forlorn and the forgotten, the works access and respond to transnational and transcultural identity vis-à-vis the artist and the artwork as náufragos, or castaways. melissa leandro (b. 1989, miami, fl) lives and works in chicago. she holds a bfa and is a mfa candidate in fiber and material studies at the school of the art institute of chicago. leandro has presented solo exhibitions at the franklin, autotelic studios, intelligentsia, chicago, wright museum of art at beloit college, beloit, wisconsin; group exhibitions at arts incubator, bridgeport art center, chicago, gallery 400 at the university of chicago, stairway studios, chicago, golden parachute gallery, berlin, germany, art basel miami, among others. naomi leibowitz (b. 1983, chicago, il) lives and works in new york city. she holds a bfa in photography and imaging from the tisch school of arts, new york university (2005). in 2012 leibowitz’s work was selected and exhibited in behind the curtain – the aesthetics of the photobooth, an exhibition curated by the musée de l’elysée, and shown at kunst haus wien, botanique, brussels, and musée de l’elysée, lausanne, switzerland. leibowitz has presented at visualarts gallery at njcu, jersey city, nj, dumbo arts festival, brooklyn, andy gato gallery, miami shores, fl, scope basel, scope ny, among others. melvin martinez (b. 1976, san juan, puerto rico) lives and works between san juan and mexico city. martinez holds a bfa in painting from the school of fine arts, san juan (2005). martinez is the recipient of the castellon painting prize, spain in 2005. martinez has presented solo exhibitions at the david castillo gallery and wolfsonian museum, miami, yvon lambert gallery, new york, cultural institute of the national gallery of art, san juan, and the alcorcon art center, madrid, spain, among others. his work is collected by museo de arte contemporaneo de castilla y leon (musac); museo de bellas artes, castellon, spain; espai d’art contemporani, castellon, spain; map, museum of ponce, puerto rico; mac, museum of contemporary art, puerto rico, among others. dan rizzo-orr (b. 1989, phoenix, arizona) lives and works in chicago. he holds a bfa from the school of the art institute chicago. rizzo-orr has presented at heaven gallery, silent funny, chicago. rizzo-orr will be making his solo debut september 2015 at 4th ward project space. mindy rose schwartz (b. chicago, il) lives and works in chicago. she holds a bfa in sculpture and an mfa in studio arts from the university of illinois at champaign and chicago, respectively. schwartz has presented solo exhibitions at queer thoughts, three walls, new capital gallery, joymore gallery, chicago and group exhibitions and presentations at eric hussenot, paris, france, nada new york, material art fair, mexico city, mexico, gowanus ballroom, brooklyn, renaissance society, chicago, among others. 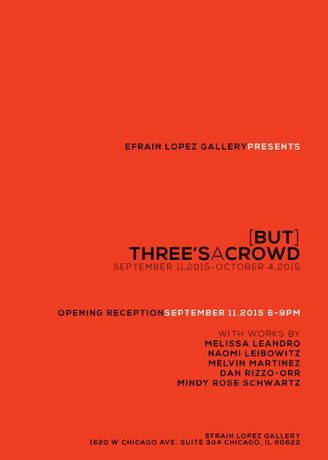 (but) three’s a crowd will be on public viewing at efrain lopez gallery, 1620 west chicago avenue, suite 304, chicago, il 60622 from september 11, 2015 through october 4, 2015. an opening reception will take place on september 11, 2015 from 6pm to 9pm.